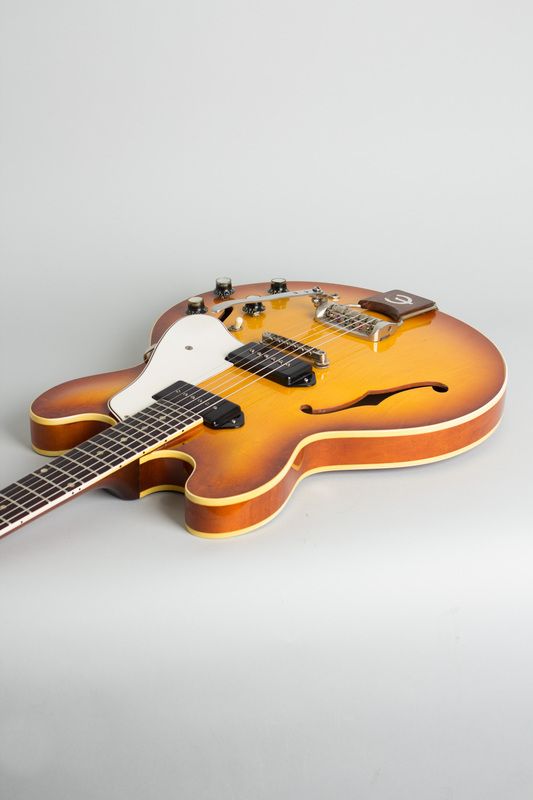 Epiphone Casino Model Thinline Hollow Body Electric Guitar (1961), made in Kalamazoo, Michigan, serial # 35766, sunburst lacquer finish, laminated maple body, mahogany neck with rosewood fingerboard, original tan hard shell case. 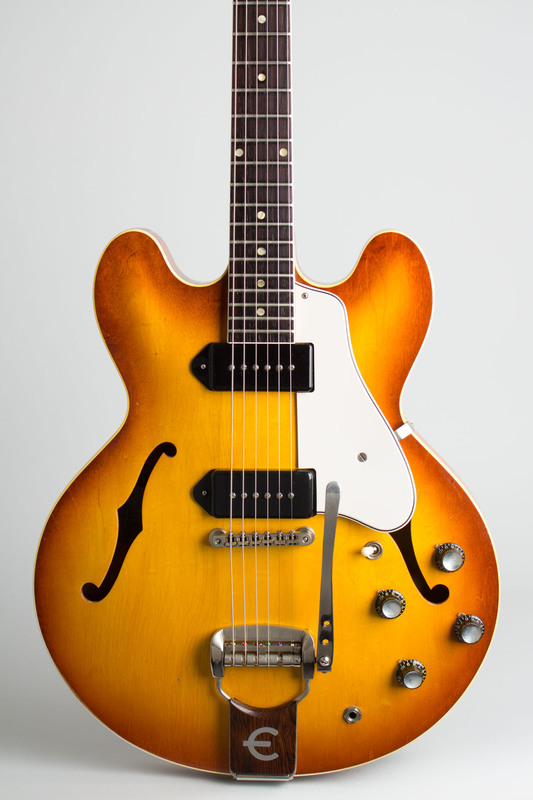 This is a very nice all-original example of an Epiphone Casino Model ES-230TDV from 1961, the first year of issue for this classic model. 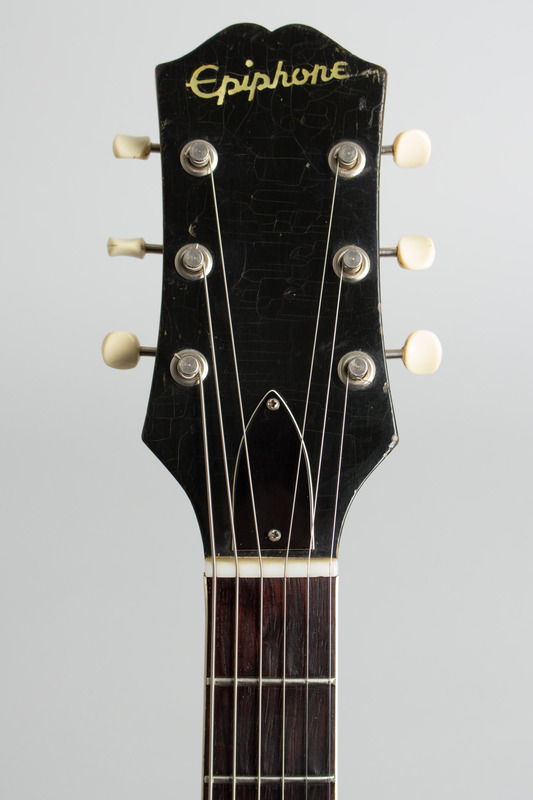 This guitar remains in very fine condition, showing all the earliest features of the Casino. 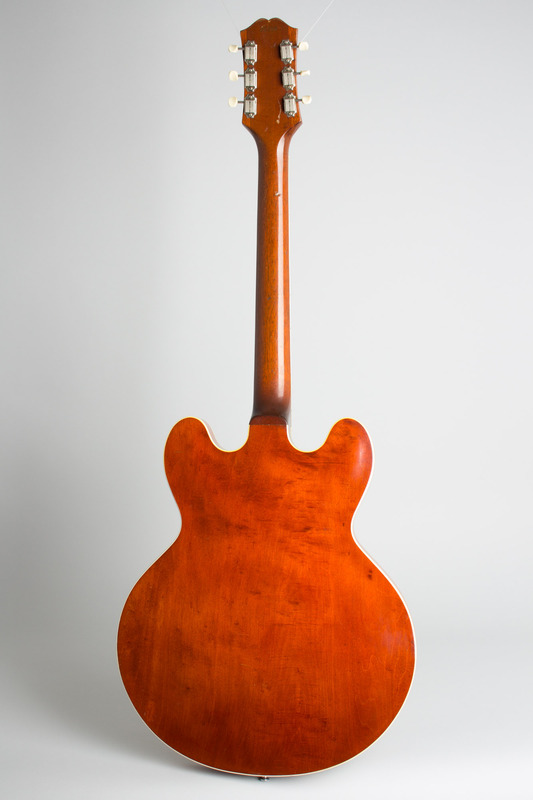 The finish is a beautiful subtly blended light sunburst, quite different from the darker Gibson 'bursts of the time. There is dot inlay on the bound rosewood fingerboard, and 1950s-style black plastic covers on the P-90 pickups. In 1962 the model was fitted with pearloid block inlay and nickel-plated metal pickup covers, making this first version a rather rare example. Only 153 vibrato-equipped Casinos were shipped out in 1961. 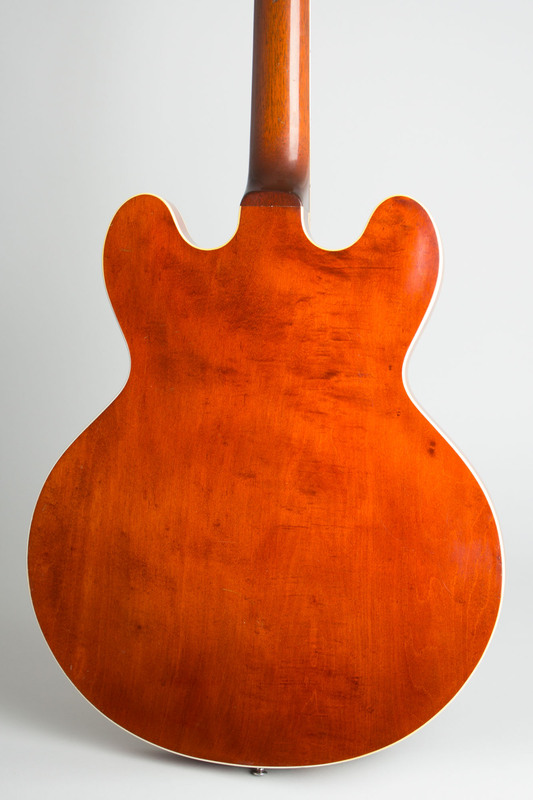 The single-bound body is fully hollow, unlike the semi-hollow 335-355 series, and the neck joins the body farther in at the 16th fret. The neck profile is the wide, flat "1960" style that would be changed back to a chunkier, rounder feel the next year. 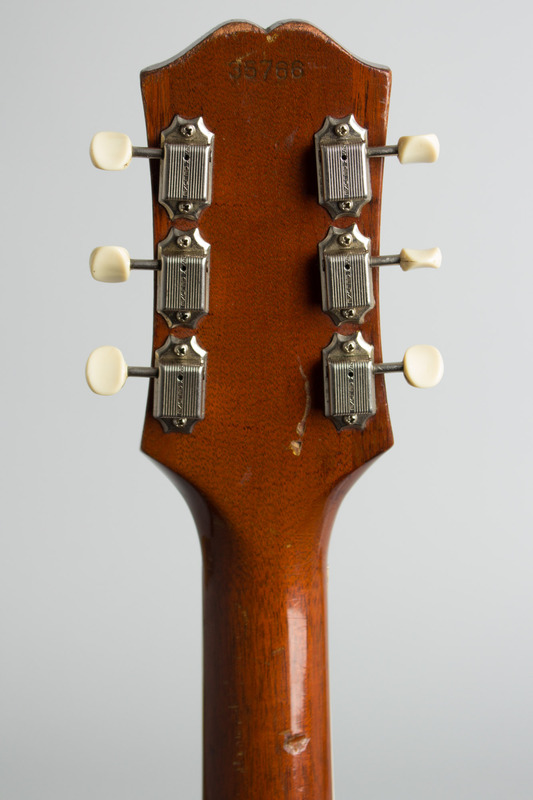 The early "short" headstock carries a pearl Epiphone logo; the tuners are individual enclosed Kluson Deluxes with plastic buttons. The twin P-90 pickups are mated to the standard Gibson wiring rig, with '60s-style plastic tone and volume knobs without markings on the metal cap and a white switch tip. The nickel-plated Tune-O-Matic bridge is the original '50s style "no-wire" version. This instrument is fitted with the "Tremotone" vibrato, an extra-cost option at the time. The Epiphone Casino is a great-sounding, versatile guitar at home in many musical situations. Despite being intended by Gibson as an "amateur" instrument (the least expensive of the double-cutaway thinlines), the Casino has been used by professional players in many styles of music since its introduction. This two pickup, Tremotone-equipped guitar was the most expensive version of the Casino and listed at $314.50 in 1961; it is also complete with the very rare original #1519 blue-lined hard case, which added $50 to the price. 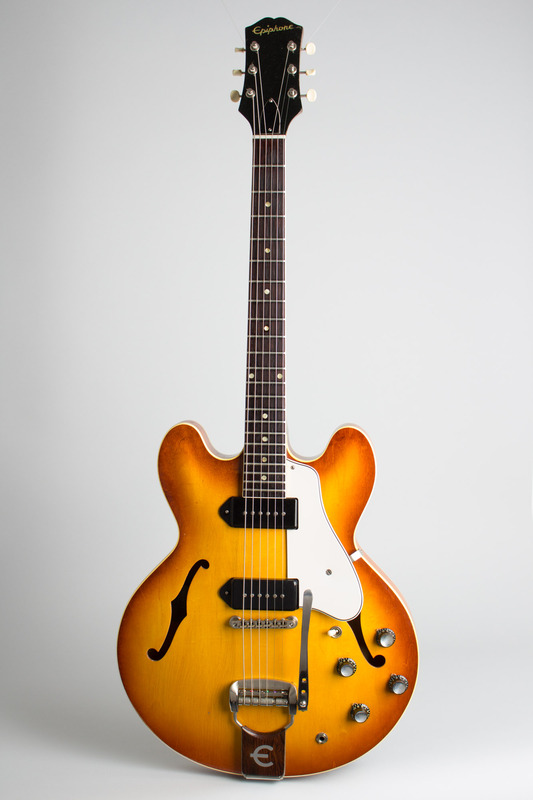 The Epiphone Casino was especially popular in the UK in the early 1960s, distributed aggressively by the jobber Rosetti as a pro-grade guitar. It was featured in the hands of countless '60s British invasion bands -- The Beatles, The Rolling Stones, The Kinks, and many more all used them on many of their signature records. This particular guitar is one of the nicest examples we have ever had; light, handy, with a fantastic feel and the expected classic sound. Overall length is 40 1/4 in. (102.2 cm. ), 16 in. (40.6 cm.) wide at lower bout, and 1 3/4 in. (4.4 cm.) in depth, measured at side of rim. Scale length is 24 3/4 in. (629 mm.). Width of nut is 1 11/16 in. (43 mm.). This is a clean and original guitar overall, with some wear but no major damage or repair. All hardware appears complete and original except the Epsilon "E" logo fell off the pickguard, from the looks of it many years ago. There is a small patched spot on the side of the upper body horn where a strap button was mounted; currently there is no forward strap button (which is how it came originally), but we can add one if requested. There is light checking to the finish and some dings and dents, the most notable on the rear of the headstock and a filled ding on the back of the neck behind the second fret. There is some light wear to the frets and fingerboard, but the guitar plays well and feels fantastic. Complete in its original HSC -- the first of these we have had, as most Casinos shipped in chipboard originally! Excellent Condition.